Drivers in the West Valley, Murray City, and Orem areas in need of a brawny SUV should look to the VW Atlas. This robust vehicle offers a sturdy drivetrain and a high towing capacity to make adventuring easy. At Volkswagen SouthTowne, we want to showcase what this muscular vehicle has to offer. Read more about the towing capabilities of this car and what makes it so strong. The 2.0L turbocharged four-cylinder engine comes standard among the various trims for this SUV. With 2,000 pounds of towing capability, you are able to easily tow a small aluminum boat to a vacation spot. As for the 3.6L V6 engine, drivers are able to achieve 5,000 pounds of towing using the factory-installed trailer hitch. This hitch comes standard with the SEL and SEL Premium trims. With 5,000 pounds of towing capability, drivers are able to tow a small hard-side RV with little trouble. In order to enhance towing capabilities, the 2018 VW Atlas offers available 4MOTION® all-wheel-drive. This enhanced drivetrain technology enables drivers to handle every bump in the road with ease. Snow and rain will be of little concern to drivers equipped with the all-wheel-drivetrain as well. You’ll be able to get the best handling possible with these helpful driving modes that tune your car to the road’s conditions. Hitching will be easy using the available driver assistance features aboard the 2018 VW Atlas. You will feel peace of mind when you back towards your cargo using the available Overhead View Camera. This technology uses multiple cameras to create a bird’s-eye-view of the area around you for easy reversing towards your hitching target. For added control over your driving while you tow, this SUV is equipped with standard Electronic Stability Control. The vehicle will correct for swaying to ensure that you are always on the right path. 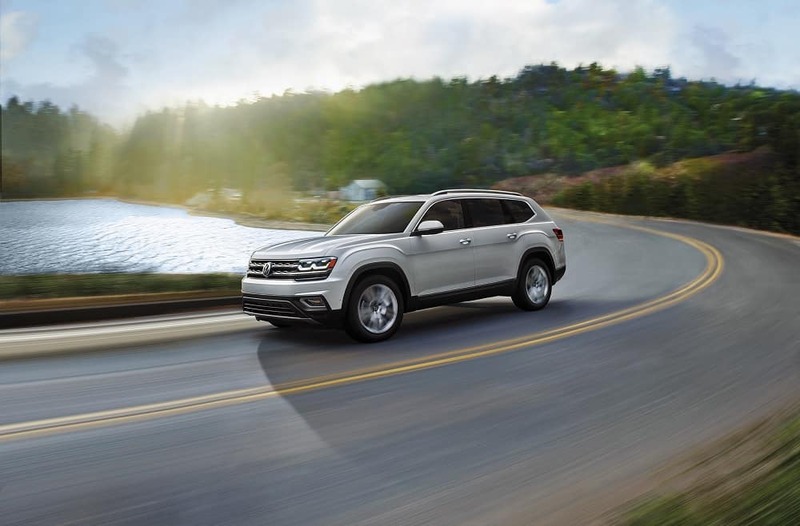 If you’re looking for a powerful SUV designed with great handling in mind, the VW Atlas is for you. Our team at Volkswagen SouthTowne aims to help drivers in the West Valley, Murray City, and Orem areas find the right car for them. If you’re interested in giving the VW Atlas a try, schedule a test drive with us online or over the phone today!